Kiev, Ukraine: A Ukrainian comedian who plays an accidental president on television delivered a walloping rebuke to the country’s political class in the presidential election on Sunday by emerging first in a crowded field of candidates, early results indicated. The comedian, Volodymyr Zelensky, 41, captured more than 30 per cent of the vote — a strong showing by a maverick with no political experience, though far below the 50 per cent needed to win the first round outright. With over half of all ballots counted by Monday, Zelensky held a comfortable lead over incumbent President Petro Poroshenko in a vote deemed largely free and fair by the national electoral commission. 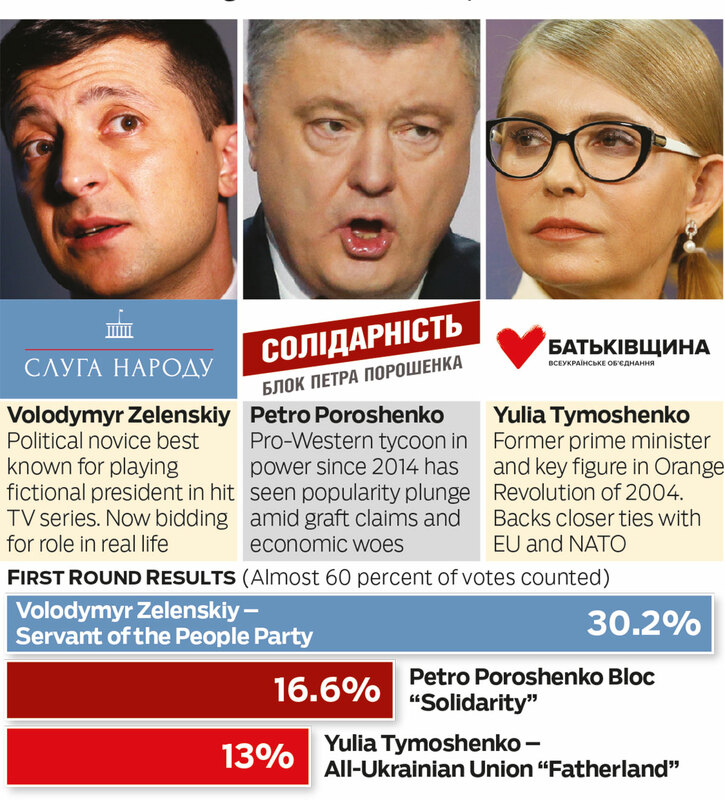 A crowded field of 39 candidates has now shrunk to just two, with Zelenskiy and Poroshenko set to go head-to-head in a second round run-off on April 21. With 50.4 per cent of ballots counted, Zelenskiy held 30.2 per cent of the vote, the Central Election Commission said. The result is a powerful challenge to the veteran politician Poroshenko, at 16.6 per cent, and former Prime Minister Yulia Tymoshenko, who trailed in third place with 13.1 per cent. Turnout was estimated at about 63 per cent in an electorate of 30 million people, slightly ahead of the 60 per cent who voted in 2014. Is this a case of art imitating life for Zelensky? In a crowded field of candidates, most of them politicians, Zelensky stood out as the star of a popular television series in which he plays a schoolteacher who is unexpectedly propelled into the presidency after his anti-corruption tirade goes viral. “He is doing well because there is a widespread mood in Ukraine of alienation from politicians and the political class, which is not unique to Ukraine,” said Robert Brinkley, a former British ambassador to Ukraine who is now chairman of the Ukrainian Institute in London, an educational and cultural centre. So what’s the challenge for Zelensky now? Propelled by his anti-establishment appeal, newcomer Zelensky must convince voters he is fit to lead a country that has been at war ever since protests in 2014 ejected a pro-Kremlin government and Russia annexed the Crimean peninsula. He has been criticised for being an unknown quantity and light on policy detail, and his victory speech on Sunday provided little further insight into what he would do if handed the top job in the second round vote. Why does the result matter? It was a stunning result in an election that will help to determine the future of a country that has become the European front line in a new era of confrontation between Russia and the West. The grinding war it has spawned has left 13,000 dead and displaced millions since 2014. The fact that Ukraine works as a real democracy, albeit a troubled one, is often cited as perhaps the most important aspect of the election. Unlike the Potemkin elections in neighbouring Russia and Belarus, the contest in Ukraine offered voters a real choice, with the outcome unknown. Should the world be wary of a fresh crisis in Ukraine? Both Zelenskiy and Poroshenko face firmly west, and neither wants to move Ukraine back into Russia’s orbit. But investors are also keen to see if the next president would push reforms required to keep the country in an International Monetary Fund bailout programme that has supported Ukraine through war, sharp recession and a currency plunge. Why are Ukrainians angry with traditional politicians? The basic knock on politics in Ukraine is that ever since the country declared its independence from the Soviet Union in 1991, it has been run by a government of oligarchs for oligarchs. Despite anti-government uprisings in 2004 and 2014, the country’s fundamental character remains unchanged. Avenues for the abuse of government contracts and other corruption have been reduced but not eliminated, and the stigma of graft dogs the entourage around Poroshenko. Ukrainians seem more fed up than ever. A mere 9 per cent say they have confidence in the government, and 91 per cent see it as corrupt, according to a Gallup poll conducted in March. Did Zelensky benefit from that anger? Yes. That anger gave rise to Zelensky, who has blurred the lines between his television character and his candidacy. His show, “The Servant of the People,” became the name of his party. Many voters say they feel as if they know him after watching him on television for years, similar to what many Americans say about President Donald Trump. 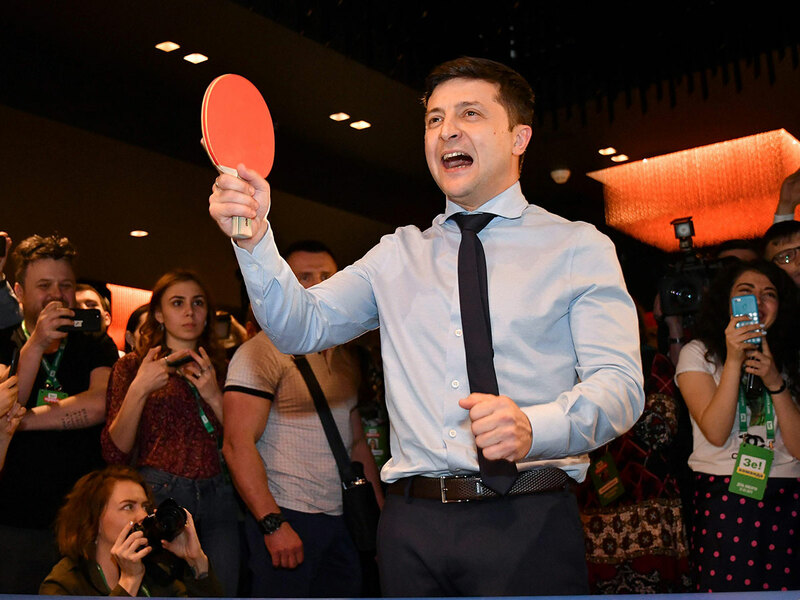 Despite his fresh-face appeal, however, questions hang over Zelensky. Some wonder if he may be a surrogate for Ihor V. Kolomoisky, an oligarch and bitter rival of Poroshenko who moved to Israel after becoming embroiled in a banking scandal that cost Ukraine $5.6 billion. Although Zelensky has been a business partner with the oligarch through television and announced his candidacy on Kolomoisky’s channel, both men have denied any covert link. Zelenskiy’s character in the show “Servant of the People” is loved by Ukrainians fed up with how their country has been governed since independence in 1991. Now they have the chance to turn fantasy into reality in presidential elections. The 41-year-old actor announced a presidential bid on New Year’s Eve and he has since emerged as the surprise front-runner ahead of incumbent Petro Poroshenko and opposition leader Yulia Tymoshenko in a crowded field of 44 candidates. Zelenskiy’s sudden rise comes at a time voters around the world have upended the status quo, propelling anti-establishment forces such as US President Donald Trump and Italy’s 5-Star Movement, which was also once led by a comedian, to power. Asked in an interview what sets him apart from other candidates, Zelenskiy pointed to his face. “This. This is a new face. I have never been in politics,” he said after hosting a TV comedy talent show. After performing in student theatre, Zelenskiy came to prominence as a team captain in the TV show KVN, where teams compete against each other with jokes and song-and-dance routines. In 2003, his team formed the basis of TV production company Kvartal 95, which makes Servant of the People. Disaffection with how little has changed under Poroshenko has helped fuel Zelenskiy’s popularity, according to Serhiy Leshchenko, an investigative journalist and lawmaker. “The desire of Ukrainian citizens is to have new faces, to have new politicians ready to reshuffle the whole political class,” he said, comparing the comedian to Trump.